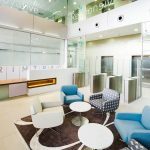 The IA Design team were appointed by the Commonwealth Department of Human Services (DHS) to design and manage the refurbishment and interior fit-out of their Corporate Property and Environmental Management branch in Tuggeranong, ACT. The project spanned 5,415m2 across 4 floors, and was focused on building a contemporary workplace that was supportive, efficient, communicative and empowering, and importantly, environmentally sustainable. The project’s contemporary interiors feature a combination of block colours, geometric patterns and cedar timber battens, and the open plan layout offers a highly functional and interactive space for employee collaboration and interaction. The project was awarded a 4.5 star NABERS rating upon completion, successfully meeting its objectives to reduce environmental impact and improve thermal comfort for all users. The project was completed in 2012 without the disrupting daily operations of the DHS, and the new space is fully compliant with the latest BCA and DDA access codes.